We recently went to see Horrible Christmas at The Lowry, Salford. As reviewers we have seen a lot of pantomimes over the years so it made a nice change to see something completely different. 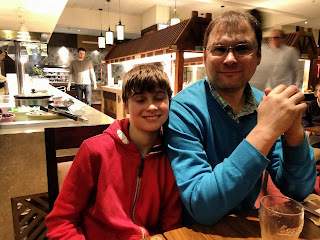 We set off straight after school and had tea at The Real China restaurant at The Lowry Outlet. We enjoy the Chinese buffet and it is great as you can eat as soon as you arrive. I always find the drinks add up when we are out for a meal but at The Real China you can get free refills on soft drinks which saves us a lot of money. The Real China also offer a 20% reduction on your food bill if you show your theatre tickets which was an added bonus. December is always hectic so it was nice to have the opportunity to spend some time together and have a nice meal followed by a theatre show. We visit the theatre a lot for What's Good To Do but the boys stay at home so it was good to have a review that they could come along to. 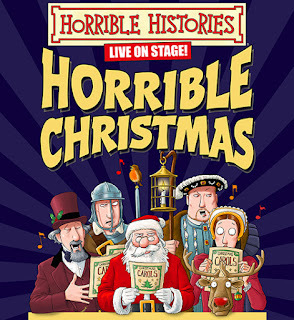 We have a couple of the Horrible History CD's and I have seen the TV show occasionally so I was looking forward to seeing the Christmas production. 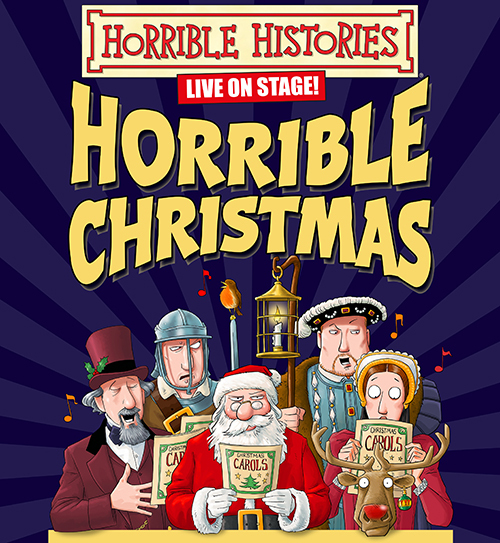 Horrible Christmas is written by Terry Deary and the play is performed by The Birmingham Stage Company, it is currently showing at The Lowry Theatre until the 8th January. So what is Horrible Christmas about? In a nutshell as I don't want to spoil it - Christmas is under threat from the evil Sydney Claus, ably assisted by his most famous reindeer Rudolph. We follow them as they travel through history in an effort to get Christmas cancelled for ever. What they don’t reckon on is the determination of Wendy Watson (Rebecca Livermore), who overheard their plans and teams up with super sleuth Shirley Holmes (Lauryn Redding) to save Christmas. 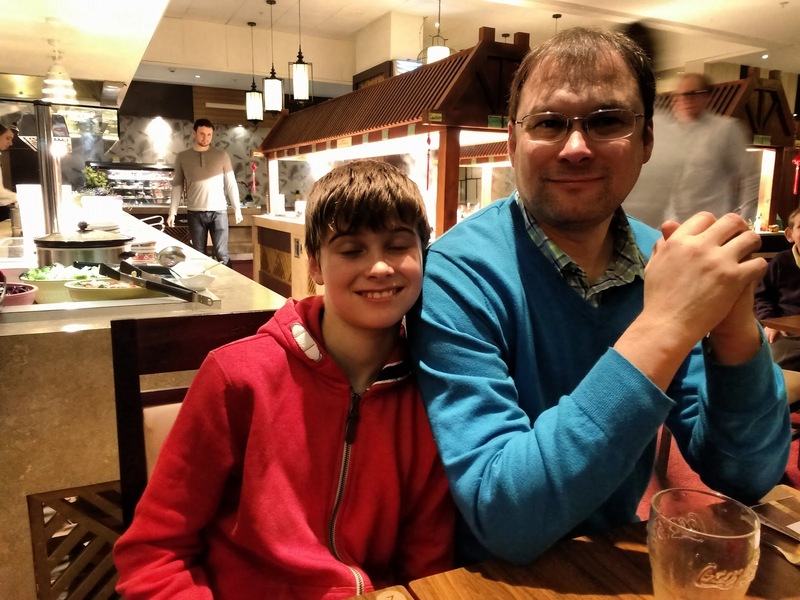 William and Luke have always enjoyed reading the Horrible Histories books and watching the TV shows so they were both really looking forward to the play. I was expecting a light hearted educational look at our Christmas traditions and was pleasantly surprised when the show included so many of the elements of a traditional Christmas pantomime. There was plenty of humour, appealing to both children and adults and of course the all-important toilet humour that I have come to expect from Horrible Histories. On top of this were plenty of catchy songs and all in all it was a winning formula that had everyone laughing from start to finish. During the course of the evening we met a host of important historical people, I especially liked Charles Dickens and his maid. Charles Dickens was writing his famous book, A Christmas Carol, and his maid was trying to help him get over his writers block. We also met a rapping Charles II, Oliver Cromwell, Henry VIII and many more characters from the history books. As you would expect from Horrible Histories the play is full of interesting facts presented in a fun and exciting way. Whilst we knew the basic historical facts we never knew quite which way the story was going to take us, making it all the more entertaining. The main four actors remain as the same character throughout wearing the same costume but the other four switch costumes and roles almost continuously. Chris Gunter is brilliant as Sydney Claus and Neal Foster is outstanding, playing the main historical characters, we all loved his rap when he was playing Charles II and the boys especially liked him as St Nicholas in Turkey. The time travel takes place on Sydney’s special time travelling scooter and there are plenty of lights and special effects, these were very bright but worked well and Luke especially liked that bit. We really enjoyed the play and it made a refreshing change from a traditional pantomime. Mark has got to the age where he likes nothing better than booing the baddies, laughing at fart jokes and singing along with the children to the turkey song and I think he enjoyed the show more than some of the children did! We will certainly be looking out for other Horrible History productions as we never stopped laughing all night!